The title of today's article comes from The Rime of the Ancyent Marinere by the English poet Samuel Taylor Coleridge. The speaker, a sailor on a becalmed ship, is surrounded by salt water that he cannot drink. That no longer applies to us. We now have a brand new watermaker on the boat, and it's the top of the line. 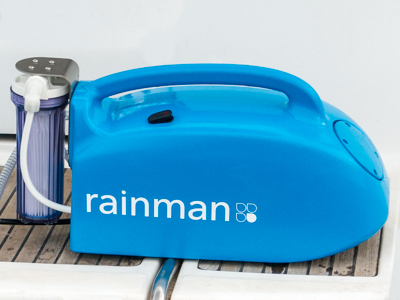 The Rainman produces 140 liters per hour, more than nearly any other watermaker on the market. This means we can fill our fresh water tank, from empty, in less than two hours. These watermakers are amazing pieces of equipment. They can take seawater, put it under high pressure (close to 800 psi), and pass it through a semi-permiable membrane. The output? Clean fresh drinking water. In fact, if you put it in a clear jug next to municipal tap water you can visibly see the difference in colour and clarity with the tap water having a brown tinge to it while the watermaker's water is crystal clear. 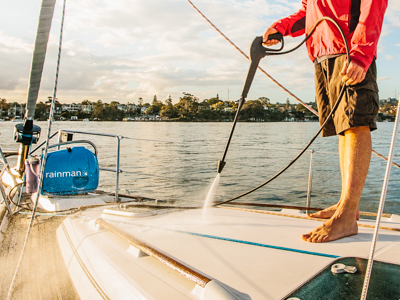 Our Rainman watermaker comes in two pieces, and is really ingenious way of building it. 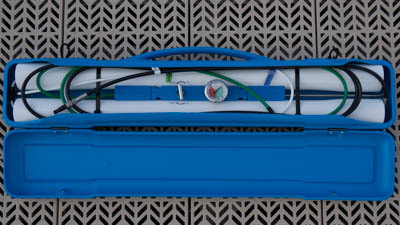 All watermakers have the pressure pump and the membrane. What Rainman has done is separate these into two portable units. The pressure pump unit is available in four formats, 12 volt, 120 volt, 240 volt, and gas powerd. The 12 volt unit is designed for boats without electric power and runs off the batteries. The 240 volt unit is for European and African boats that have 240 volts/50 Hz electric. While the 120 volt 60 Hz model that we have is for North American boats. They also have the gas powered unit which has a small Honda engine in it for boats that do not have enough electricity to run the pump. The other piece of the puzzle is the membrane. Rainman gives you three choices again. They have a single 1m (40") reverse osmosis membrane. This is their most economical unit and produces about 60 liters per hour. Their two 50cm (21") reverse osmosis membranes unit also produces about 60 liters per hour. The top of the line is then the two 1m (40") reverse osmosis membranes which produce 140 liters per hour. This is the unit we purchased. You can see that if you were manufacturing these as a single unit the way most companies do you would have to produce 12 different units to accommodate the different options. Actually ten as the 12 volt power unit can only use the single 1m membrane. But by making the units in two portable pieces it's up to the purchaser to decide which pieces they want. Now, if you haven't spent enough money, that's no problem, because you can spend more! When you are in the ocean the salt content is always the same. But if you are in a river mouth, or a enclosed bay that is fed by fresh water, then you may not have pure ocean water. This partial salt water, partial fresh water is called "brackish" water. On any watermaker, water output levels will increase as salinity levels of the source water decrease. While this can be good, it is important to ensure flow rates do not increase beyond the rated output to prevent damaging the reverse osmosis membrane. So we opted to get the Brackish Water Flow Gauge. We also opted for the Pressure Washer Attachment which converts your pressure unit into a salt water pressure washer to clean your decks. This is great for removing encrusted salt when you've been on a long voyage. It's also good for cleaning the underside of the boat when we beach it. We've actually found a way to wash the deck with fresh water too. When we arrive at an anchorage, we first make fresh water to fill our boat's water tank. Once the tank is full we fill several buckets with fresh water. Then we switch to the pressure washer and, still using salt water, wash down the boat. Then we take the water input and place it into one of the buckets of fresh water and use that for a final rinse down of the decks. This has the added benefit of leaving fresh water in the pumps instead of salt. The unit is designed for salt, so does it make a difference? I don't know. But knowing how corrosive salt water is, I feel better leaving it with fresh water in it. Overall this is an amazing piece of technology, and the ability to have fresh drinking water where ever we go is vital. Never will we be like that poor ancient mariner who was dying of thirst while surrounded by water. Now, we've talked about the unit, but that's only one half of the story. First you have to get one. We ordered ours from Sea Task Group, in Florida. But you have to keep in mind, we don't have a home address for shipping. So we arranged for them to ship it to a marina in the Bahamas. That means we had to arrive at the marina, and it had to arrive at the marina, at the same time (give or take a day). Our salesman did an amazing job, getting the unit ready for shipping, and then personally driving it to the airport to make sure it would be on tomorrow's flight. Sure enough, the next day it was at the airport in Nassau. We rented a car and drove to the airport, got it cleared through customs, and it was ours! What amazing service we received. As a side note, for those who don't know how importing things works. Normally when you import something you have to pay duties and taxes. In the Bahamas, some duties run as high as 72% (used automobiles). Then the VAT is added on. That's like GST in Canada. At 7.5% here in the Bahamas, it means that you could end up paying as much as $1849 for each $1000 imported (and this unit was many thousands...). That can quickly add up to ridiculous amounts when traveling, and would seriously scare visitors away from a country. That's why foreign boats can show your cruising permit, and import boat parts free of all duty and taxes (you do have to pay a broker to do the paperwork, that's a flat $40). Photos from http://www.rainmandesal.com, used without permission under fair use policies.